w_module implements a module encapsulation and lifecycle pattern for Dart that interfaces well with the application architecture defined in the w_flux library. w_module defines the public interface for a module and is in no way prescriptive as to how module internals are defined, though the w_flux pattern is recommended. 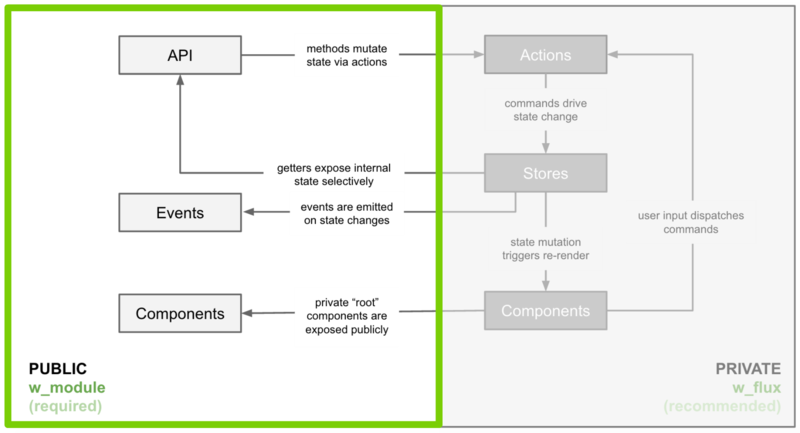 w_module defines how data should flow in and out of a module, how renderable UI is exposed to consumers, and establishes a common module lifecycle that facilitates dynamic loading / unloading of complex module hierarchies. The api class exposes public methods that can be used to mutate or query module data. The events class exposes streams that can be listened to for notification of internal module state change. The components class exposes react-dart compatible UI components that can be used to render module data. Though the class based Module convention is somewhat arbitrary, exposing api, events, and components via aggregate classes simplifies consumption and improves the discoverability of the Module's public interface. If using w_module with w_flux internals, api, events, and components should be internally initialized with access to the module's actions and stores. A Module's api member should expose all public methods that a consumer can use to mutate module state (methods) or query existing module state (getters). api is initially null. If a module exposes a public api, this should be overridden to provide a class defined specifically for the module. If using w_module with w_flux internals, module mutation methods should usually dispatch existing actions available within the module. This ensures that the internal unidirectional data flow is maintained, regardless of the source of the mutation (e.g. external api or internal UI). Likewise, module methods that expose internal state should usually use existing getter methods available on stores within the module. A Module's events member should expose all public streams that a consumer can listen to for notification of internal state changes. events is initially null. If a module exposes public events, this should be overridden to provide a class defined specifically for the module. A Module's events are intended to be 'read-only'. Though events are exposed for listening by external consumers, they should only be dispatched from within the Module. To enforce this limitation, a dispatch key is required to instantiate the event stream. The same dispatch key must subsequently be used to dispatch all events on the stream. Keeping the dispatch key private in the Module internals effectively prevents uncontrolled external dispatch. If using w_module with w_flux internals, events should usually be dispatched by internal stores immediately prior to a corresponding trigger dispatch. events should NOT be dispatched directly by UI components or in immediate response to actions. This ensures that the internal unidirectional data flow is maintained and external events represent confirmed internal state changes. To assist in properly disposing of Event instances, w_module provides an EventsCollection base class that extends Disposable from the w_common package with an additional manageEvent() method. Colocating related events in an EventsCollection makes it trivial to close all Event instances by disposing the EventsCollection instance. // All Events on the collection should now be closed. A Module's components member should expose all react-dart compatible UI component factories that a consumer can use to render module data. components is initially null. If a module exposes public components, this should be overridden to provide a class defined specifically for the module. By convention, the custom components class should extend the included ModuleComponents class to ensure that the default UI component is available via the module.components.content() method. If using w_module with w_flux internals, components methods should usually return UI component factories that have been internally initialized with the proper actions and stores props. This ensures full functionality of the components without any external exposure of the requisite internal actions and stores. w_module implements a simple Module lifecycle that ensures that modules adhere to a predictable loading and unloading pattern. Using Module as the basis for all modules in an application ensures that this simple pattern will extrapolate predictably across complex module hierarchies. Many examples of Module lifecycle behavior and manipulation can be found in the Multiple Module Panel example. Module exposes five lifecycle methods that external consumers should use to trigger loading and unloading behavior. These methods can return an error or exception thrown by their respective lifecycle handler methods. This allows dependencies on a Module to respond to failures that occur within the overridden lifecycle behavior. load Triggers loading of a Module. Internally, this executes the module's onLoad method and dispatches the willLoad and didLoad events. Returns a future that completes once the module has finished loading. suspend Suspends the module and all child modules. While suspended modules should make themselves lightweight and avoid making network requests. resume Brings the module and all child modules out of suspension. Upon resuming, modules should go back to business as usual. shouldUnload Returns the unloadable state of the Module and its child modules as a ShouldUnloadResult. Internally, this executes the module's onShouldUnload method. unload Triggers unloading of a Module and all of its child modules. Internally, this executes the module's shouldUnload method, and, if that completes successfully, executes the module's onUnload method. If unloading is rejected, this method will complete with an error. The rejected error will not be added to the didUnload lifecycle event stream. The graphic above illustrates legal lifecycle state transitions. Any state transition that is not defined will throw a StateError. No-op transitions are illustrated with blue arrows. Calling the lifecycle method when the module is already in the given state will result in a logger warning. If a no-op is performed on a transitioning state the pending transition future is returned. Module also exposes lifecycle event streams that an external consumer can listen to. If any corresponding lifecycle handler method throws an exception or error it will be added to the corresponding stream. This allows dependencies on a Module to provide an onError function to handle recovering from a failure within the module implementation. willLoad Dispatched at the beginning of the module's load logic. didLoad Dispatched at the end of the module's load logic. willSuspend Dispatched at the beginning of the module's suspend logic. didSuspend Dispatched at the end of the module's suspend logic. willResume Dispatched at the beginning of the module's resume logic. didResume Dispatched at the end of the module's resume logic. willUnload Dispatched at the beginning of the module's unload logic. didUnload Dispatched at the end of the module's unload logic. Internally, Module contains methods that can be overridden to customize module lifecycle behavior. Any error or exception thrown by these overloaded lifecycle methods will be added to their corresponding lifecycle event stream. This error will be returned to the caller of the corresponding lifecycle method. onLoad Executing during the module's load logic. Custom logic for initializing child modules, service access, event listeners, etc. should be implemented here. Deferred module loading behavior can also be hidden from consumers via this method. onSuspend Executed during the module's suspend logic. This method should be used to modify module behavior while suspended. onResume Executed during the module's resume logic. This method should be used to put the module back into its normal mode of operation. onShouldUnload Executed during the module's shouldUnload logic. Custom logic that blocks module unloading under certain conditions should be implemented here. onUnload Executed during the module's unload logic. Custom module clean up logic should be implemented here. Unfortunately, the nature of web browsers is such that module unload logic is not guaranteed to be executed under all conditions (browser or tab close), so mission critical logic should not reside here. loadChildModule Loads a child module and registers it with the current module for lifecycle management. willLoadChildModule Dispatched at the beginning of the child module's load logic. didLoadChildModule Dispatched at the end of the child module's load logic. childModules An iterable of child modules. isLoaded A boolean that indicates whether the module is current loaded. isSuspended A boolean that indicates whether the module is currently suspended. This will always be false when the module is not loaded. If the unload succeeds, then disposal will happen implicitly. 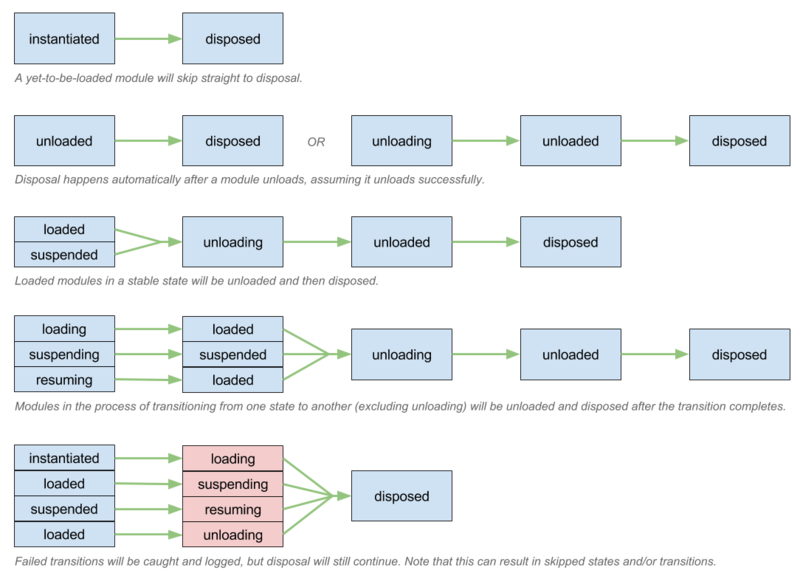 dispose() will attempt to unload the Module first (unless it has never been loaded, in which case it will go straight to disposal), but will force disposal regardless of the outcome of the unload step. 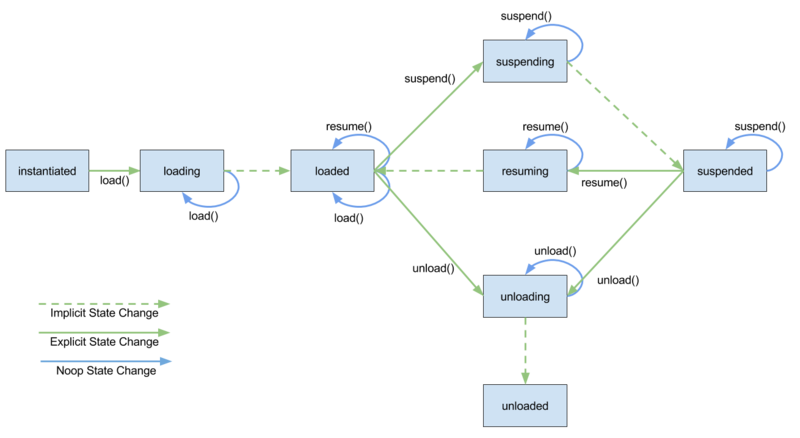 In most scenarios, consumers should use unload() either directly or indirectly via the other lifecycle management APIs like loadChildModule(). Calling dispose() should be reserved for scenarios where you know the Module has not been loaded, but still needs to be disposed, or when you need to force the disposal of the Module regardless of its state and do not care about the Modules ability to prevent its unloading. Unit tests are a likely candidate for this usage. Simple examples of w_module usage can be found in the example directory. The example README includes instructions for building / running them. Clear the list of child modules when the parent module is disposed. Use manageDisposable() to manage a child module as soon as it is added instead of manually disposing each child module during parent module disposal. Feature: Added OpenTracing support to Module. See the tracing documentation for more info. BREAKING CHANGE: Remove the package:w_module/serializable_module.dart entry point, as it depended on dart:mirrors which is no longer supported in the browser in Dart 2. To run the examples, open the root of this repository in a command-line terminal. No platform restriction found in primary library package:w_module/w_module.dart. line 206 col 30: Use = to separate a named parameter from its default value. line 207 col 31: Use = to separate a named parameter from its default value. line 223 col 30: Use = to separate a named parameter from its default value. line 224 col 31: Use = to separate a named parameter from its default value. 1 image link is insecure (e.g. http://codecov.io/github/Workiva/w_module/coverage.svg?branch=master), use https URLs instead.